Securing sustainable food for everyone is one of the world's most pressing challenges, but research, policy, and programmes remain fragmented, and effective solutions have been slow to emerge. 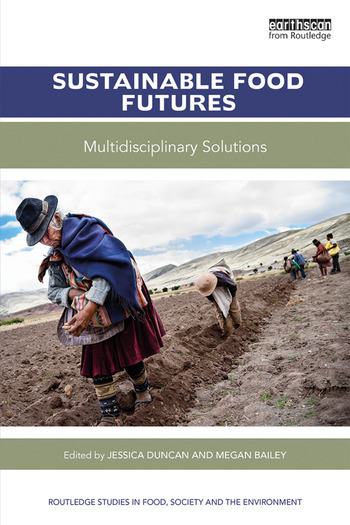 This book takes on these challenges by proposing a range of solutions that can advance pathways towards sustainable food futures. Complete with recipes, this book is structured so that readers are taken in a logical progression through discussions of solutions, highlighting the need to recognise the importance of place and the importance of participation, and to challenge dominant descriptions of markets, through to re-designing food systems. The solutions presented in this book are based on real-world cases, but discussions remain deliberately broad to encourage thinking in new ways. Cases are drawn from Africa, Asia, Europe, and North and South America. The book is of relevance to those interested in sustainable food futures, and can serve as a supplementary textbook for a wide range of courses in food studies and related disciplines. Cultured meat, better than beans? Jessica Duncan is an Assistant Professor in the Rural Sociology Group, Wageningen University, the Netherlands. She is the author of Global Food Security Governance: Civil society engagement in the reformed Committee on World Food Security (Routledge, 2015). Megan Bailey is an Assistant Professor in the Marine Affairs Program and Canada Research Chair, Integrated Ocean and Coastal Governance, Dalhousie University, Canada.